In another question someone posted a photo of a skier going up an apparently extremely steep slope on skins. This slope looks so steep that skinning would be really difficult (especially on an icy slope without ski crampons), and the mountains in the back seem "off". Is this image rotated or altered in some way? Image from an article on straightchuter.com regarding steep skinning technique. On the right snow, you can ascend extremely steep (even if it probably isn't the most economical thing to do) - so from that aspect, I don't see a problem. Looking at the skiers center of gravity, it doesn't seem to be off by far either. I estimated the center of gravity at the red dot. If the weight was mainly on the back leg, the current orientation would make sense (vertical red line). However the picture is shot in the moment before the left/back leg is pulled to the front (it is almost stretched, right/front foot rests on "climbing assistance post" (German Steighilfe)), so most of the weight will be on the front leg. There is an ongoing front motion, so being slightly behind the front leg might be fine, but not that much. In conclusion I would estimate the angled red line to be vertical. I agree that the mountains in the background look weird, but the crop is so close that it's hard to tell for certain without additional context. It cannot be that the image is rotated, and that this rotation is the only alteration to the image. The reason is simple: look at the straps of the backpack. They are hanging vertically, and they are aligned with the vertical axis of the image. Essentially, they give us a "plumb line". If the image had been rotated, that detail would have to have been doctored also to conceal the ruse. there had been a headwind (somehow not shielded by the climber's body) which tilted the straps by a few degrees, allowing for the rotation to make them appear vertical. the photo was snapped just as the climber made a forward lurch. A momentary forward lurch would not only tilt the hanging backpack straps, but also foil the analysis of the body posture and center of gravity and all that. In general, what we see as a static situation in a still picture may in fact be an illusion created by taking a snapshot of a momentary dynamic situation. There is a pattern of cascading trails in the accumulated snow left behind by sliding powder suggesting that the picture is upright. 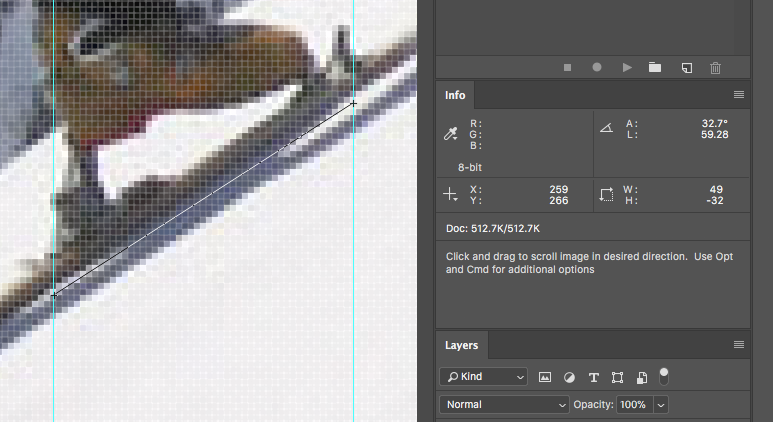 The inset duplicate of that detail indicates with red lines what I'm referring to. I just wanted to give my input as an avid backcountry skier and general ski bum during the winters. As mentioned above, the straps seem like a pretty good indicator that the picture is real. Even if he was moving, skining up a slope is a pretty smooth movement that wouldn't disturb the straps much. If there was any wind then there is a low chance that the two straps would be parallel with each other. Posing for a picture like this would be pretty easy. Given grippy snow conditions, you could skin up an entire mountain at that angle. Many people I know (including myself) prefer a steep skin track because it makes the Elevation Gain/Distance Traveled ratio higher. Although I think it is technically more energy efficient to be at less of an angle. 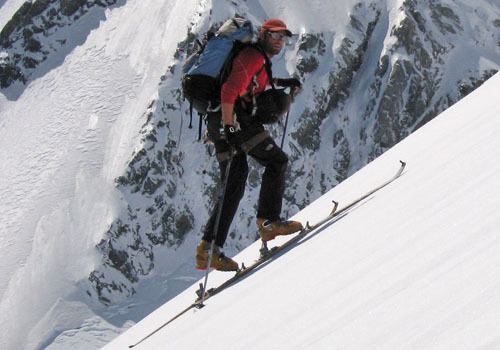 Seeing as this was posted to an article specificaly about steep skining, and the ease of taking such picture. I would say there isn't any motivation to fake it. The picture in the answer to that question you referred to here doesn't have a source listed for attribution. To me, however, it does look like the same picture as the one in the answer to the question that ShemSeger suggested as a duplicate. 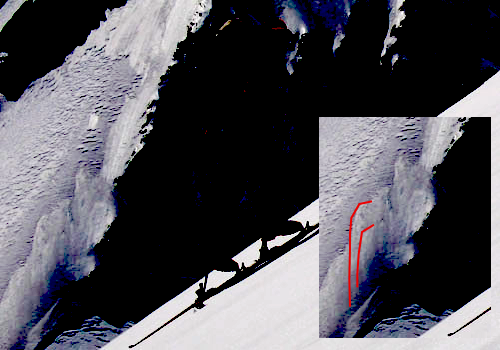 That answer attributes the picture to a site called Straightchuter, which gives the name of the person who made this climb and the technique, called Steep Skinning, needed to do it. If indeed that is the same picture, then the picture you have would not have been altered. Chris Figenshau skinning up a 34-degree icy slope in New Zealand with textbook perfect style. These are the instructions he offers in order to make this climb. Plant your poles near to your toepieces – not too far forward or off to the side. Stay off of your edges. If you need to move sideways, “crab” to the left or right by moving your entire ski instead of trying to edge. Look up and forward, not down at your boots. As the Bloodhound Gang song goes – “Lift your head up high and blow your brains out.” Steep skinning may be painful until you get the hang of it, but it also gets you places in a hurry. If you find yourself slipping, try lifting your big toe. This is hard to do if you are leaning forward, (so lean back) and it will help shift your weight to the aft. It’s like hitting the brakes. Not the answer you're looking for? Browse other questions tagged skiing alpine-touring or ask your own question. Boot toe wiggles in frame touring binding - is this ok?